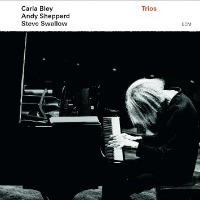 Trios concentrates the essence of understanding that Bley, Sheppard and Swallow have developed over two decades of collaboration. She recorded the album’s five pieces in various configurations on earlier albums, but the spare instrumentation of her piano, Sheppard’s saxophones and Swallow’s bass creates space for leisurely exploration of the deep harmonic possibilities in her compositions. Most of all, though, melody is what dominates these performances—intriguing melodies like those of “Utviklingssang,” “Vashkar” and others written by Bley—but also those invented by Sheppard, a great tenor saxophonist. Swallow long since, in effect, remade the electric bass. He solos with the facility of a guitarist and, as in the first movement of “Les Trois Lagons (d’après Henri Matisse),” can create walking bass lines that make you want to dance. This album has become a habit around here.